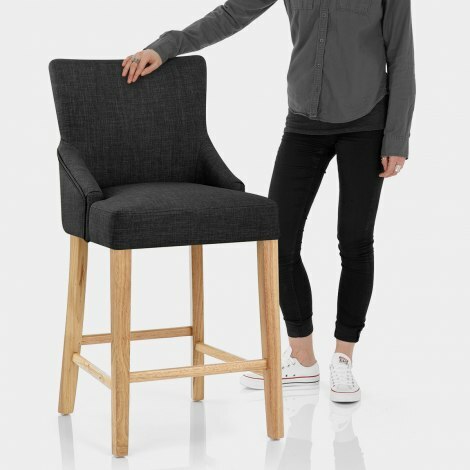 A modern variation of a traditional, fixed height stool, the Magna Oak and Grey Fabric Bar Stool successfully blends multiple styles in its eye-catching design. Bringing a touch of sophistication to your bar area, the Magna combines comfort with fashionable charm. Exuding contemporary elegance, the padded and sprung seat is upholstered in a cool, charcoal grey fabric. Featuring a high backrest, it also lightly curves around the body for supplementary support. The solid wooden frame comprises of four oak finished legs that are connected by bracing bars, with a front brace that doubles as a footrest when seated. "Great chairs that are so comfortable to sit on"
These chairs are sturdy, beautiful and exceed expectations. They were delivered within 24 hours and make a big difference to our new kitchen. Our breakfast bar is the only eating area in our house so comfort was essential. Plus given a four year old needs to be able to comfortably and safely use these seats; these bar Stools were the perfect option for us. Great chairs that are so comfortable to sit on! Good value too ! Maybe improve the instruction sheet? I am so pleased with these stools. They arrived promptly and service throughout was second to none. Such helpful assistants, couldn't fault them. The stools are excellent quality. Sturdy and well designed. They look amazing and everyone has admired them. 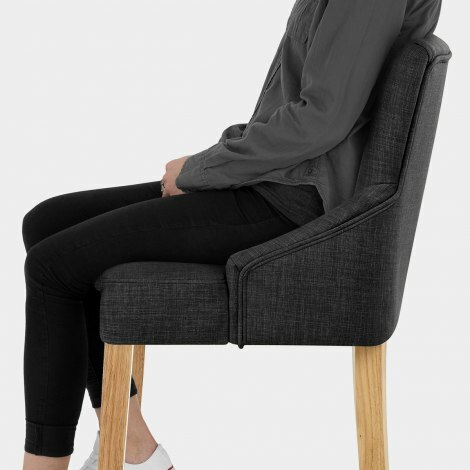 They are comfortable and the back and sides make for a very relaxed seating position. We ordered three through recommendation of our daughter, delivered as agrees. Product is very stylish and good quality. Very happy.